Na piskvorky.net czas serwera jest identyczny dla wszystkich dostępnych do wyboru języków logowania. Proponuję zmienić pkt 6.3 i pozostałe odnoszące się do CET na "server time". Poprzednim razem zmiana czasu była powodem nierozegrania w zaplanowanym terminie spotkania pomiędzy Way i Outsiders w sezonie 2013/2014. Po sezonie sugerowałem zmianę treści obowiązującego wówczas punktu wraz z uwagą, że "CET byłoby dobre, ale(...)". (6) At 19:49 CEST I got a response from Mikhail, ''Hi! Our captain needs to be asked I am not playing today '' The response was made about 10 minutes after Mikhail read my message. Ilya remained offline. He initially was in excellent mood, showing his joy by smiles and phrases including, ''The Hungarians are getting zero this round ,'' and emphasising that the Hungarians had to come at CET. (iv) In March 2017, Zukowski made a post in the Euroleague thread on vk.com/gomoku to warn people about the time change in Europe, and Ilya replied, ''Michał, we have decided to change time in the rules to Prague time (instead of CET/CEST) '' This indicates that Ilya read Zukowski's post and had a good idea about the common practice. Sandra, how this hypothesis refers to the message from Ilya on EL Forum? Piotrek, I am unsure whether I get your question right, but I guess you want to ask how Hypothesis 1 is consistent with Ilya's message posted on the EL forum a day before the match, or, in other words, how Ilya's message does not contradict Hypothesis 1. That's very simple: Ilya in principle knew that clocks in Europe change each spring and winter and that the times on the EL website are to be interpreted as actual times in Poland/Czechia/Hungary, but it simply did not come to his mind that clocks in Europe had already changed. He somehow failed to think about it. He lives in Russia, where clocks do not change at all. Time in Europe does not affect his everyday life. Apparently he got overburdened by his work in Yandex as well as by his everyday duties, and nothing reminded him about the time change in Europe, so he had exactly the same state of mind as during the European winter time period. That is, mentally he was still in the European winter time period when he made his post on the EL forum. And if the match were in the European winter time period, it would indeed have to be played at 19:00 CET = 21:00 MSK. These times are exactly what Ilya wrote. He would have written exactly the same message in, for example, the first or second round of the Euroleague. Yesterday I talked again with Denis Kachaev, and he said he had been overburdened by many duties in his life and had simply relied on his captain. Denis said he had simply been told by Ilya to come to play at 21:00 Moscow time, and had simply done so. So I think the situation is indeed caused simply by Ilya's negligence. 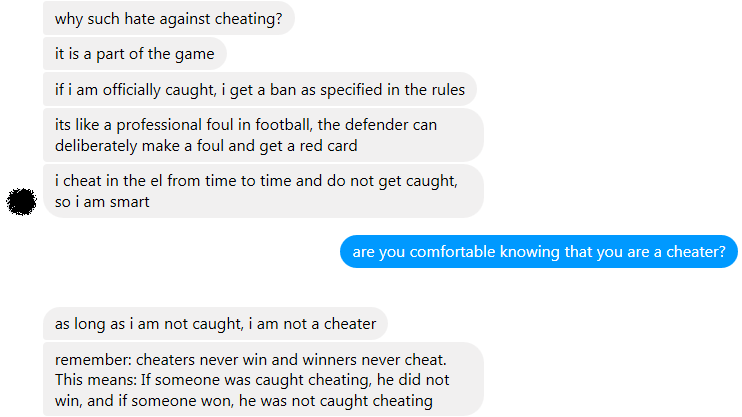 I think that it is only after the ''match'' that the Russians discovered they could use the formal rules to try to avoid a loss by walkover despite their negligence. Then Ilya started pretending he had been unaware of the common practice and had used the rules as a guidance. This explanation by Ilya does not pass the laugh test, as he negotiated, played, and watched many EL matches in the past. I think the truth is that, as I said, it simply did not come to his mind that clocks in Europe had been changed. Pioterk, as you are one of the EL organisers, I tell you what: If the rules had been properly updated in accordance with the common practice, i.e., if ''CET'' had been replaced by ''Warsaw time,'' there would not have been any scandal. It would have been a simple walkover without any arguments and suspicions of bad intent. The scandal was partially provoked by the EL organisers. And it also would not have taken them much effort to drop a line to each non-European captain to inform about the time change, or would it? - In the WBC rules, written by me, I used the term ''Warsaw time'' for clarity. - On the schedule page, I explicitly wrote that all times were Warsaw times. - A few days before the time change, I put an inscription in bold red font on the schedule page to say that clocks in Warsaw were changing. - I sent private messages with notifications about the upcoming time change to a number of participants who, in my opinion, might forget about or be unaware of the time change. And here is my rhetoric question: Was anything of the above done in the EL by the EL organisers? Sandra, whu didn't you mention Slovakia? Btw, why have the EL rules not been updated since the incident? It does not take long to replace ''CET'' by ''Prague time,'' or does it?